Looking for an HP Smartcalc 300s? Please buy the SmartCalc on Amazon. I recently decided to try to add a few reviews of some other non-graphing calculators. Since I’ve looked a lot at Hewlett Packard’s lineup of calculators a lot recently, I thought it made sense to start with an HP SmartCalc 300s review. Who Is the HP SmartCalc 300s Designed For? The HP SmartCalc is a scientific calculator. That means if you need a graphing calculator, you’ll need to look elsewhere. However, if you are a beginning algebra or geometry student, looking for a calculator that can do trigonometry, a backup to your graphing calculator, or if you are just in a situation (class or test) where graphing calculators are not allowed, the HP SmartCalc was probably designed for you. 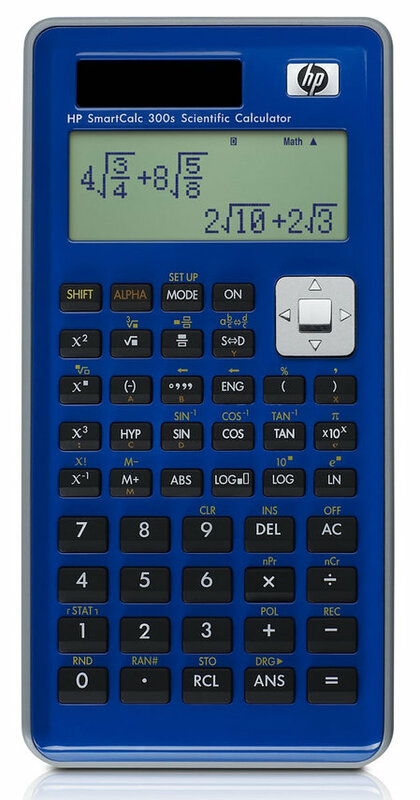 It’s a two-line calculator, meaning you can see both your answer and the calculation that you entered at the same time, which I’d recommend for anyone looking for a scientific calculator. Heck, this is an easy enough calculator to use that it would be appropriate for elementary school kids. Why I Like the HP SmartCalc 300s? This calculator has some really nice features that can only be found on a few scientific calculator models. First off, everything is done with “mathprint” formatting. In other words, this the SmartCalc will display fractions as fractions, exponents as exponents, etc. You won’t have to learn a lot of calculator syntax because the SmartCalc just displays calculations the way they show up in a book. I also LOVE how the SmartCalc handles radicals (square roots). It simplifies square roots rather than return them as decimals. This is great for most math classes where teachers prefer radical form over decimal form. This carries over to trig functions, where the SmartCalc will give you exact trig values. This is a huge advantage in trigonometry through calculus. One last advantage of the SmartCalc is its ability to do non-base 10 logs. While many graphing calculators have this feature, there are very few scientific calculators that have it. And while you can certainly work around that problem with the change of base formula, it sure is nice not to have to worry about it. The HP SmartCalc is good scientific calculator. It’s features competes well with Texas Instruments’ TI-30X Multiview (review). It’s easy enough for a kid to use, but powerful enough for a college student. If you are looking to buy the SmartCalc 300s, I recommend buying it on Amazon.